According to content analysis experts BuzzSumo, reporters receive, on average, between 25 to 100 Kickstarter press release pitches every day. That’s via email alone. Nearly all of them get deleted, unopened. If you’re about to click send on hundreds of emails to members of the press, this news is probably disheartening. It seems that even if you do it right, your Kickstarter press release pitch might get lost among the dross. But don’t lose hope! 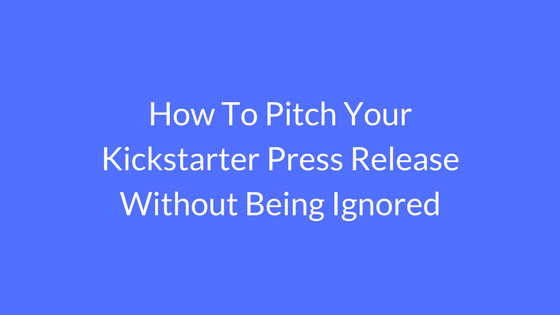 While developing a series of successful Kickstarter campaigns, I’ve learned some valuable lessons on how to get the press to take notice of your Kickstarter press release and product launch. By following some basic rules, you can ensure your crowdfunded campaign stands out from the masses. Emails which are totally not relevant to you are annoying, to say the least. When reporters receive pitches that have nothing to do with their field, they see it either as spam or desperation. Both are bad for your reputation, as they will inevitably delete future pitches from you, even if they’re now relevant. Most publications have hundreds of journalist working for them. It is therefore really important to pitch to the right person. DO NOT email everyone working at the publication. It will be a waste of your time and theirs, and you’ll definitely annoy potential allies. To zero in on the right journalists, make a list on Excel. Make a tab for journalists who have written about crowdfunding projects, and one for those who have written about projects in the same field as yours. If you’re pitching a smartwatch, for example, choose those who have written about wearable technology in the past. See an example here: Please request access if you’d like the Excel template for pitching to the press CLICK HERE. One of the most frustrating stages of emailing pitches is not knowing whether the recipient has opened the email. Thanks to programs like Yesware, you can now know the exact moment when a journalist opens your email and how many times they do it. This is invaluable information. If a journalist opens your email, then you know it has reached the right person and that your subject line did what it was supposed to and got them interested. It’s the subject of your email and its headline that will convince the recipient to open your pitch and actually read it. Make your subject-specific and interesting enough to make the journalist want to see what’s inside. Your heading should immediately engage them, as they only have time to scan most of the emails they open. Similarly, keep your pitch concise. You’ll have information you feel compelled to share which technically might be necessary to really get your product. But unless it’s absolutely crucial, leave it out, or you’ll end up with an essay. Synergy. Thinking outside the box. Paradigm shift. Low hanging fruit. All of these are terms that no longer mean much, and cause many to turn away in disgust. Yes, they once meant something. But now they serve as signs you have nothing new to say. Look, everyone thinks outside the box and every startup wants to shift paradigms. Applying these terms to your idea creates white noise that obscures what you really have to offer. If you think there’s no better way of expressing your point, think again. Even if it’s the most accurate term, a buzzword will do much more damage than good. Even if you’ve followed every tactic in the book, there’s no guarantee your pitch will be opened. Many journalists are just too busy even to open only the interesting emails. Which is why there’s nothing more valuable than personal connections. You can build relationships at conventions and events, or keep in touch with those who’ve responded to you in the past. Sometimes, getting the results you want is as simple as timing it to perfection. There are loads of statistics showing the best time to send an email. You probably know from your own experience how many emails flood your inbox every day. Those that come through during your lunch break get pushed to the bottom of the pile and, unless they’re from someone you know, will get ignored. Timing is essential in pitching to the press, and there’s science to back it up. Research done by AdvisoryHQ found that pitching between 8 am to 11 am on a Tuesday, Wednesday or Thursday is most likely to get you results. This is when reporters are most likely to be at their desks, while not yet overwhelmed by the workload. Pitching to the press is a losing battle if you don’t know what you’re doing. In an ideal world, a great product would speak for itself. But this is a world in which everyone has access to the press, no matter how bad their idea may be. Getting your campaign to stand out requires strategy and connections. Don’t take shortcuts, or you’ll be stunned by the deafening silence.